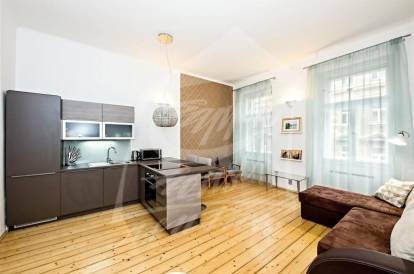 Smart bright 1 bedroom apartment on the 2. floor of a brick building with a lift, near city centre in Žižkov, Prague 3. The apartment is offered for LONGTERM or MIDTERM LEASE (minimum 1 month period) and it is AVAILABLE IMMEDIATELY. Spacious living room with seating area and kitchen / dinning area. Kitchen is fully equipped (fridge, freezer, dishwasher, microwave, glass hob, el. oven), dining table with chairs, sofa bed, coffee table and chairs, and lovely wooden floor. Bathroom is en-suite, with shower and washing machine. Toilet with little sink is accessible from the hall. Spacious built-in wardrobe in the hall. Rooms have separate access. INTERNET INCLUDED IN THE PRICE. Great location - quiet neighbourhood near the city centre with restaurants, cafes, pubs, tram by the house, metro 5 min away. Utility charge includes energies and wifi, security deposit 1 month rent incl. utilities. Interested in this property, ID 34776?